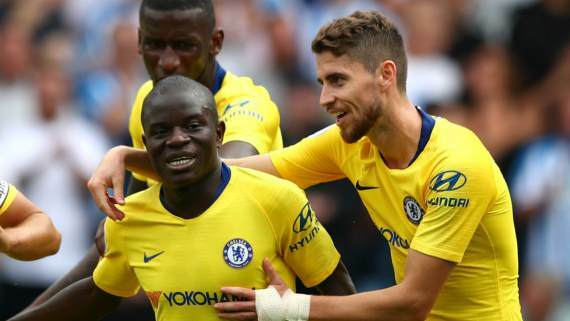 Chelsea boss Maurizio Sarri says N'Golo Kante lost his positional discipline in last Saturday's 3-1 defeat to Tottenham Hotspur and ultimately this has to be corrected. Kante has been assigned as a more advanced role for the Blues this season under Sarri, but in theory is employed as more of a box-to-box midfielder. However, against Spurs it appeared that the France international was getting caught out too high up the pitch which seemed to leave holding midfielder and playmaker Jorginho exposed. While the scoreline ended 3-1, it could have been more on the day such was the tactical disorganization of Chelsea on the day. The Italian said: "As you know I want to play a central midfielder with great technical ability, so Jorginho and Cesc Fabregas. "I don’t want Kante in this position. Kante tried to solve the match on Saturday, but in the wrong way. He tried to be too attacking. "Maybe it is a question of time. He needs to stay near to Jorginho. It depends on the action [Kante getting forward]. If the ball is on the left, no. He has to stay very close to Jorginho. Meanwhile, striker Olivier Giroud who got Chelsea's only goal after the earlier strikes from Dele Alli, Harry Kane and Son Heung-min, added: "I think N'Golo can play every single position in midfield. In the manager's philosophy, how he wants us to play, Jorginho is the holding midfielder or Cesc...that's a very important part of our game. "Maybe in the manager's mind, N'Golo is more efficient playing that position box-to-box. He can be more efficient carrying the ball, finding passes between the lines. "Obviously we know how fast he is. When he recovers the ball, he can penetrate the lines. That's one of his main strengths as well. It's a good position for him. He maybe needs to be more selfish around the box when he has the opportunity to shoot. "I'm pretty sure he will score more goals. We know it's not his main strength, but he's very important for us in recovering the ball. He's everywhere. We don't need to question his position. He just needs to adapt to what the manager wants."